Map Description A small map I made to try out the HourPitores texture pack. I thinked it turned out well since this wasn't a serious effort. But I guess I could say I'm happy with the turn out. 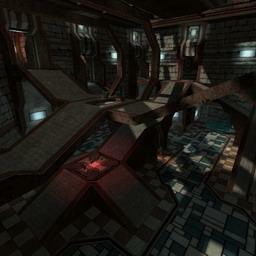 Just added in game screenshot and fixed an elevator texturing error. I've already checked the beta...there're improvements but the archi still don't work for me...but who cares. Coz this map plays great! This is for sure the best map from cooloola till jet. May it scaled a bit to big and the action is always in the middle room. Flak dominates a bit (in my opinion), but over all nice gameplay! Actually I have to give it a 10, coz it's way better then my Epitow...^^but I think a 8 will also do it! Good work! Nice us of my tex. Nice map only the architecture bothers me too. The smaller archi is good but the overal picture doesnt work. The rooms come across like big cubes with stuff in. The problem lies in the very flat ceilings everywhere I think, they dont hide the basic cubes well enough. The sky also needs work, its far from pretty and too simple. But the rest is nice. Thx milb and Hourences. I do struggle with the "big picture" of my maps, visually speaking. But hopefully my next maps will be better, or at least i think they do the way my WIP are turning out. I think you're being too nice. About the weapons I placed near teh wall so that if anyone goes for'em they become easy pray for flak monkeys (like me). The screenshots, i must confess, was a stupid mistake i had imported them in mylevel but i forgot to set it in mylevel properties. Still thanks for teh feedback maybe I'll reupload it during (my) weekend (which is thursday and friday). Maybe I'll repay the favor (hints to Eternal Sands review ;) ). I didn't expect that much of this map, because it's the only one cooloola ever uploaded here. You can imagine, I was more than just surprised. Visuals are excelent(sometimes reminded me of milb's style, they are a little inspired by Eptow, right?^^), and there was obviously a great effort put in details. The "stream" outside is one of the coolest things I've ever seen for UT! Only thing I didn't like so much about the outside was that lake, the rocks around are too flat on the top. But everything else looks really nice, cool pillars, perfect trims and alignment, great work here! Lighting is also very nice, those shadows from above look great! Next good point is the bot-pathing, had no troubles here. But now something I didn't like: The weapons. The placement is ok in general, but why are some weapons placed so strangely? Take the Minigun or the Shock Rifle, why are they lying somewhere near the walls and not in the middle of the way, where they belong imo?! This looked really strange, like they where just "thrown" in there. i have dl this map but haven't had a chance to play much lately - i did check out the beta tho so i can say good job cooloola - keep making these nice maps eh? cool! Good job! Hourences' textures look always cool, good job here. I don't like the architecture as a whole, too, like Hourences said, the rooms (as rooms) are still too cubic imho. But overall good job! I watched the beta-threat at UP, good improvements..
Looks like the wiched shizzle, cooloola.